Mount Kineo in Moosehead Lake. Photo © Jym St. Pierre. October 7, 1998 - Rick Holley, Plum Creek president and CEO, reportedly tells the Portland Press Herald that the company has no plans to sell land for vacation homes, camps or other types of development. August 2001 - Plum Creek applies to the Maine Land Use Regulation Commission to create an 89-lot residential subdivision around First Roach Pond east of Moosehead Lake. As part of the plan, 160 acres are to be protected by deed restrictions, 494 acres by conservation covenants, and 525 acres by conservation easements. December 14, 2004 - Plum Creek Timber announces their intention to submit a rezoning proposal to the Land Use Regulation Commission (LURC) for the largest residential development in Maine Woods history, involving 426,000 acres in the Moosehead Lake region. The company simultaneously announces the acquisition of another 48,500 acres of forest land in Maine. The price is later revealed to be $33 million. Plum Creek, now the second-largest private landowner in the United States, has more than $300 million in cash on hand and is expected to continue to buy forest land. March 18, 2005 - More than a dozen prominent Maine citizens submit a request to the Land Use Regulation Commission seeking a six-month moratorium on major developments within 41 unorganized townships in the Moosehead region. The moratorium would allow LURC to prepare an updated plan for the region, as called for by its own comprehensive plan, without the pressures of dealing with major development of the region at the same time. April 5, 2005 - Plum Creek submits an application to LURC for the largest residential development ever proposed in Maine. The development is all to occur in the unorganized territories in the Moosehead Lake region. Although the proposal covers 426,000 acres, it is still only 45% of Plum Creeks ownership in Maine. May 4, 2005 - LURC denies the moratorium request. LURC also decides to include a visioning process for the Moosehead region as part of the review of Plum Creeks proposal. As a result, rather than conduct planning to help guide development, LURC will rely on large development proposals, such as Plum Creeks, to be the framework for planning in the Moosehead region. July 22, 2005 - LURC schedules four scoping sessions in August to receive information from the public for purposes of identifying issues that LURC should consider as it reviews the Plum Creek proposal. July 26, 2005 - A coalition of state, regional and national conservation organizations (including Forest Ecology Network, RESTORE: The North Woods, American Lands Alliance, Friends of the Earth) hold a news conference to announce opposition to Plum Creeks Moosehead proposal because it represents wilderness sprawl.  the Plum Creek development proposal. August 16-24, 2005 - LURC conducts scoping sessions in Greenville, Rockwood, Jackman, and Hallowell. Approximately 1,000 people attend the four sessions and many others submit written comments. There is overwhelming concern about Plum Creeks massive development plans. September 2005 - Plum Creek announces that it would soon submit a revised plan. They announce this many times over the next six months. Creeks development plan is shown in a statewide public opinion survey conducted by Critical Insights. The results show that Mainers oppose the Plum Creek plan 2 to 1 (41% to 20%). Every grouping - party affiliation, income level, northern or southern Maine - has more people who think it is a bad idea than think it is a good idea. The same poll shows solid support for creating a Maine Woods National Park (43% favor, 30% oppose). The poll is reported in the Kennebec Journal article Mainers arent sold on plans for Moosehead. 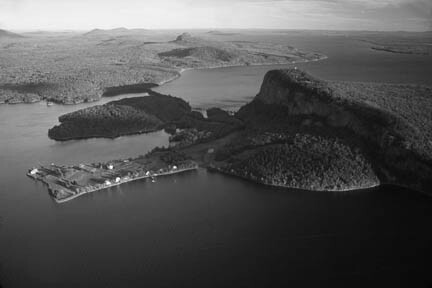 April 27, 2006 - Plum Creek finally re-submits its application to the Land Use Regulation Commission (LURC) to rezone its land in the Moosehead Lake area to allow for development. The plan is approximately 1,000 pages long and still includes the development of 975 house lots and two large resorts. May 25, 2006 - The Save Moosehead Campagin holds a news conference to publicize the massive development still in Plum Creeks proposal and to point out the deceptiveness of Plum Creeks media advertising blitz that touts their conservation framework even though the vast majority of the conservation is not part of their development plan. The conservation is only a promise to sell land and easements if Plum Creek is granted its rezoning request. There are no terms in the rezoning plan that will require the major part of the conservation to happen. June 26, 2006 - LURC sends a letter to Plum Creek raising questions about the validity of including information about Plum Creeks Conservation Framework in the rezoning application. The conservation framework states that Plum Creek would be willing to sell some land and a large conservation easement to non-profit conservation groups if LURC will approve its rezoning application. LURCs letter raises the following points: a) The conservation framework is a non-regulatory agreement between private parties that may or may not be implemented. b) It depends on private parties abilities to raise funds for acquisition. c) LURC would not be able to require that Plum Creek sell nor the private entities buy. d) Yet the framework states that the opportunity will only be available if LURC approves the rezoning application. 	still proposes develpment of two major resorts, and incresases the size of both along with satellite resort zones. This background summary and chronology, originally published in the Fall 2006 edition of The Maine Woods, a publication of the Forest Ecology Network, is an abridged version of RESTORE: The North Woods' Chronology of Events Relevant to Plum Creek Timber Company Activities in Maine. See that document for updated information.